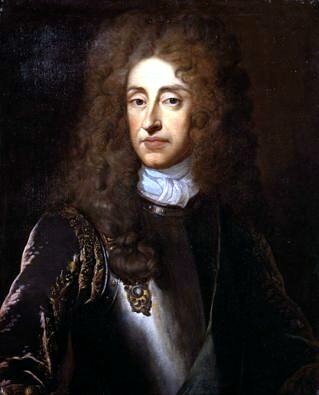 On 11th December 1688 King James II of Great Britain fled the country in a bloodless coup known as the “Glorious Revolution” inspired by the supporters of his usurping son-in-law, William of Orange. His reign had only lasted for three years. The people of Britain had made clear their views about absolute monarchs several decades earlier, when James’s father King Charles I had lost his head in 1649 and Britain became a republic under Oliver Cromwell. James’s brother, Charles II, had understood the lessons of that time and, on the restoration of the monarchy in 1660, had been careful to govern with the sentiments of the people very much in mind, whatever his personal ambitions may have been. However, James had no such qualms, being far more like his father in character than his brother had been. James believed unashamedly in the “divine right of kings” which held that it was the people’s duty to obey their king because God had put him there. Charles II may have thought this, but he would never have been so stupid as to say it. James was also openly Catholic, at a time when the people of England were, in the main, happily Protestant. He took many actions that favoured Catholics and had married, after the death in 1671 of his first wife Anne Hyde, Mary of Modena who was a staunch Catholic and who looked certain to produce heirs who would also be Catholic – indeed, she gave birth to a healthy son in June 1688. Parliament therefore saw the need to remove a Catholic king and replace him with a Protestant one, hence the invitation to James’s daughter Mary, by his first wife, and her husband William of Orange. They would reign jointly as Queen Mary II and King William III. James had no choice but to flee London when news reached him that William had landed in Devon and was on his way to force him off the throne if need be. He therefore took a barge down the Thames and, in his anger, dropped the Great Seal of England overboard so that no-one else should have it. Even this act of defiance did not work, because it was later fished out of the river and handed to King William. Incidentally, King James II did leave at least one indelible mark on the world. Before becoming king he had had the title Duke of York, and when British forces captured the city of New Amsterdam from the Dutch in 1664 it was renamed New York in his honour. The state capital city of Albany owes its name to James’s Scottish title of Duke of Albany.